Gandhi’s shrewd insight that conflict offers an opportunity to rearrange the ingredients that produced it in the first place has yet to be fully appreciated. Yet as more and more groups and societies across the world are able to know of the successful use of nonviolent tools to achieve political goals, it is possible that universal recognition of the worth and practicality of settling conflict without the insertion of violence may also grow. If anything, the inclination is toward greater use of the technique of collective nonviolent action in the twenty-first century. This Web site is about the power and limits of nonviolent civil resistance through the eyes of one of its practitioner scholars. View article: Book Talk: Gandhi Reaches Civil Rights Leaders – by Erica Moody published in the Washington Life Magazine. 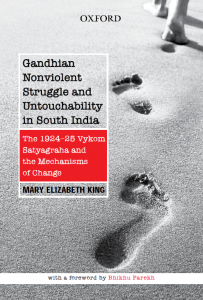 Mary King’s latest book, Gandhian Nonviolent Struggle and Untouchability in South India: The 1924-25 Vykom Satyagraha and Mechanisms of Change, is now available. I spent hundreds of hours in archives with both palace and British original documents, and newspaper morgues, in assessing the role of Gandhi, the dilemmas that he faced, and the mistakes that he made. I also interviewed specialist Keralan historians. I have reconstructed a verifiable chronology for what actually happened at Vykom (and its controversial settlement) and in this corrected context, trace the dynamics of civil resistance during this movement. For the first time, scholars and practitioners are able to evaluate this famous and misperceived struggle, which influenced the building of theory on the mechanisms of change in nonviolent civil resistance. Broadening my scope, I give fresh analysis of satyagraha and analyze the impact of the Vykom struggle on the concept and workings of civil resistance on the global level to the present day. Starting in 1919, for four decades, African-American leaders traveled to India searching for strategies on how to change what they thought comparable to a caste system, while Indians lecturing in the United States shared lessons from their nonviolent campaigns, thereby shaping the contours of the coming U.S. civil rights movement. My latest book was released by Oxford University press in India on January 27, 2015, and is available for order from OUP India and Flipkart now (which can send it anywhere). It was released in the United Kingdom on March 1, and is available for purchase on Amazon UK. It is available on Amazon (US) now, for delivery from March 25, 2015. Mary’s posting in the U.S. National Catholic Reporter (reproduced below) has had some play. It responded to claims made by Rabbi A. James Rudin (the American Jewish Committee’s senior inter-religious adviser) that Gandhi’s form of nonviolent action is rendered ineffective in response to the actions of the Islamic State and like atrocities. In her response, “Nonviolent conflict modeled by Gandhi could be just as effective today,” she uses examples from Gandhi’s own time (the Nazi occupation) and subsequently (the 1987 Intifada). In the decades since the death of Mohandas Gandhi and of his student and successor in the art of nonviolent struggle, the Rev. Martin Luther King Jr., the understanding of how civil resistance can be effective has expanded. New ideas and practices have emerged in societies that Gandhi could not have foreseen as venues for people’s movements, targeting forms of oppression that he had not encountered and which have been able to succeed against brutal regimes and dictators. The social science of nonviolent action has also deepened, showing among other findings that while violent campaigns have achieved their goals in roughly one-quarter of all cases, civil resistance has since 1900 succeeded in more than half of all such campaigns. 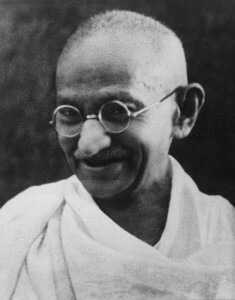 So the question posed by Rabbi A. James Rudin — whether “Gandhi’s nonviolent resistance” could be used to oppose Islamic State atrocities — sidesteps the greater reality that today, it would not be Gandhi’s notions, but a more advanced form of nonviolent conflict, burnished by the collective experience of hundreds of social movements in Gandhi’s wake worldwide, which were predicated in no small part on his experiments and practices. One of the most common and misleading criticisms of Gandhi that Rudin invokes is when he says that Gandhi was either “naïve” to believe that nonviolent action could work against the Nazis or was indifferent to their atrocities. Self-educated and relying on newspapers for foreign news, Gandhi was doubtless not well briefed on the implications of Hitler’s rise. Yet as the French scholar Jacques Sémelin documents in his classic study Unarmed Against Hitler, effective nonviolent resistance in nations under Nazi occupation was able to thwart some of Hitler’s aims. Sémelin cites civil resistance to the Nazis by teachers and church leaders in Norway; medical doctors in Holland; scholars and clergy in Poland; Czech and Slovak students and scholars; industrial strikes by laborers and miners in Belgium and France; and notably in Berlin, by the wives of Jewish men who had been taken to the death camps but were returned. All of this helped slow down and undermine the German war effort. Gandhi may have anticipated this when he said before World War II that facing nonviolent resistance would be a “novel experience” for Hitler. Indeed, the Führer was known to be furious about the impact of the Danish resistance in particular, in which Denmark’s Jews were saved. Neither he nor his commanders in Denmark knew how to deal with it without alienating and rousing the whole country, which they managed to do anyway. It is important to emphasize that even Gandhi’s approach to nonviolent action did not rest on passive resistance (by 1908, he had essentially rejected this term), but on undermining the legitimacy of oppression and increasing the costs of maintaining it. James Lawson, King’s chief strategist who had spent three years in India studying Gandhi’s work, applied this dynamic in the American civil rights movement, and many others used the action in subsequent nonviolent campaigns. Yet while the novelty of nonviolent resistance has diminished, the refusal to notice its accomplishments or understand its dynamics is still with us, as Rudin inadvertently demonstrates when he suggests that Gandhi’s techniques have not been widely used by Palestinians. In the first, largely nonviolent 1987-1990 intifada on the West Bank, Palestinians harmonized the use of more than 100 nonviolent sanctions, including marches, strikes, civil disobedience, renaming of streets and schools, resigning from jobs, tax resistance, boycotts, picketing and vigils. Resilience in the face of harsh reprisals and crackdowns came from hundreds of “popular committees,” often run by women. The 1987 intifada had an impact on Yitzhak Rabin’s thinking and led to the 1991 Madrid Conference and the opening of political space for the Oslo Accords. Fatah and Hamas subsequently alternated between armed and unarmed resistance, to the detriment of the Palestinian cause. Still, radical flanks willing to use violence have often disrupted and displaced nonviolent struggle, even while it was proving effective. The greatest risk from encouraging violent resistance against even the most hateful oppressors — such as the horrific acts by Islamic State in Iraq and Syria — is that large-scale violence in the public space marginalizes the potential role of civilian populations, upon whom both dictators and occupiers ultimately rely for their sustenance and legitimacy, the very factor that creates the potential leverage of civil resistance. “People power” is not merely a phrase; it is the hallmark of nonviolent conflict. End the cooperation of those who are oppressed, and oppressors cannot last, as Gandhi had discerned by 1905. The ways to do this multiply with every new struggle, and the knowledge of how to apply nonviolent tactics is expanding exponentially. Gandhi was its first major theoretician and practitioner, but what he advanced has animated tens of millions, from Hungary to Hong Kong, from Chile to Tunisia. History shows that doubting the power of the people to prevail without violence is a doubtful strategy, either to suppress that power or to show the way to a freer and more peaceful world. This post was first published by the National Catholic Reporter. 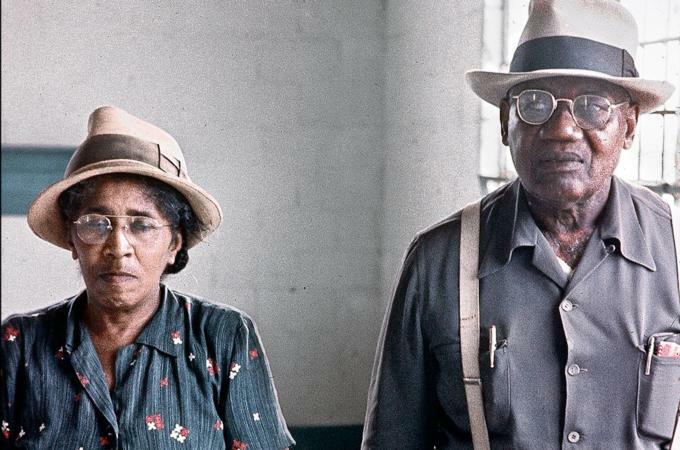 The meaning and impact of the 1964 Mississippi Freedom Summer through the eyes of four individuals, who observed it closely or were participants: Doug McAdam, Claiborne Carson, Marshall Ganz, and Mary King. This year marks the fiftieth anniversary of Mississippi Freedom Summer, one of the most consequential moments in the history of the civil rights movement. This issue of Sandstone & Tile chronicles the history of that pivotal project and the roles and recollections of Stanford participants. 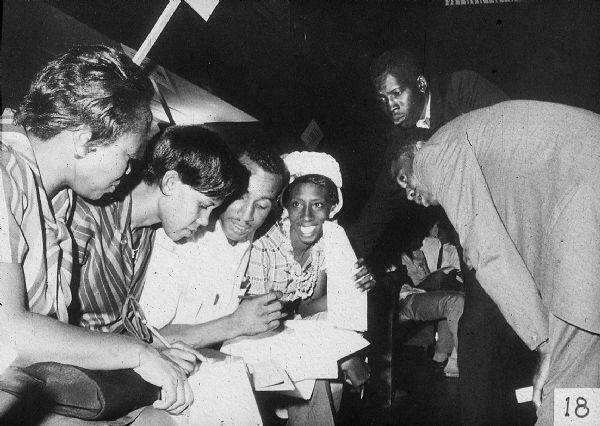 In June 1964, more than a thousand collegeaged, primarily white Northerners joined thousands of mostly black civil rights workers in Mississippi and Louisiana in a massive drive to register African American voters. Over the 10 weeks of the project, the volunteers were victims of random shootings, more than 1,600 arrests, 80 serious beatings, and eight deaths. Thirty-seven churches and 30 homes and businesses were bombed or burned. It is well known that the violence was perpetrated by white racist vigilantes and terror groups, often organized by the Ku Klux Klan in collusion with local law enforcement agencies. nationwide attention to the injustices that African Americans had endured, and it profoundly changed the lives of those who participated. In April 2014, the society and Continuing Studies co-sponsored a program to mark the fiftieth anniversary of Mississippi Freedom Summer. The program brought together four committed activists and scholars—some who participated in Freedom Summer in 1964 and others who have studied, analyzed, and written eloquently about it—Douglas McAdam, Clayborne Carson, Marshall Ganz, and Mary Elizabeth King. This article, Mississippi Freedom Summer: 50 Years Later Legacies, Lessons, and Stanford Reflections (from the Spring/Summer 2014 issue of Sandstone & Tile), has been adapted from their remarks. “You can’t think that the civil rights movement was only Martin Luther King. It was a wide variety of people, black and white, young and old,” explained US civil rights leader Julian Bond. Bond was a founding member of the Student Nonviolent Coordinating Committee (SNCC) in 1960. For several years, he worked alongside activist Mary King, handling communications, which sometimes played a life-or-death role for the movement. “Public understanding was crucial to our strategy,” King notes.